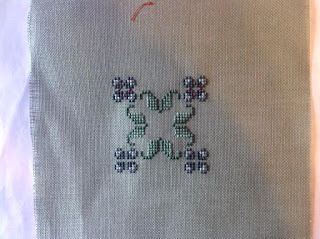 Serendipitous Stitching: Happy Dance on the Table! I recently got a special offer to get 3 issues of Cross Stitch Crazy for just £3, you'd have to be crazy to turn that down! This month's issue arrived last week with a lovely cover gift of a booklet of designs by Emma Congdon of Stitchrovia. All in her familiar typography and fonts style. Not only did I start one straight away, I finished it too! In just three days. Petite beads for bubbles in the bubbly. This one is probably closest. 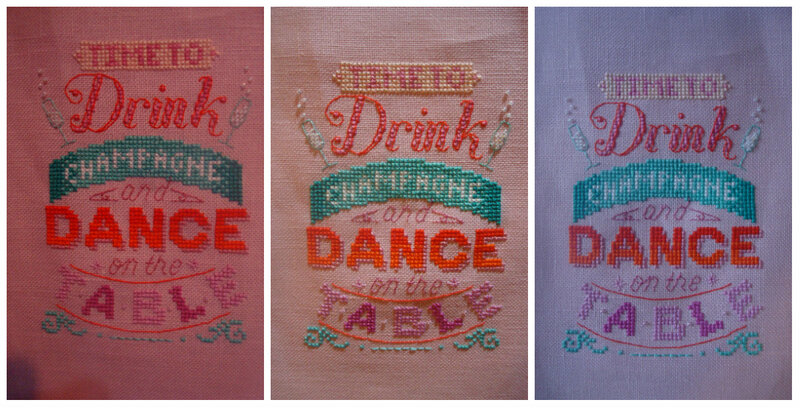 I had to change some of the thread colours so they would show up on the pink fabric (32 count linen) and I also filled in the word Champagne with Blanc. This is going to be a wedding card for a friend whose daughter goes to the same school as the Small Boy. It's perfect for her and her new hubby. Handy hint - the little tag of orange at the top is an ORT knotted through so I always know which way up is. Useful when stitching a symmetrical design on square fabric. What a cute card that will be! That is just unbelievable that is the same piece in all three pictures though!! The colors are so very, very different! Congrats on the adorable finish Jo. Yay happy dance! Looks great in all the lights! The just nan Spring in the square looks great. It's grown so much. Thanks for the longest day sal add. Wonderful design for newlyweds, I was hoping the pink one would be the true to life one. Wow, that was fast, even for you! Great finish, and fun, too. So you're doing your Longest Day event on FB - will you do a round up post here afterwards? What a happy piece of work! Love it... & yes it can be hard sometimes to get an accurate pic in regards to colour... well done Jo. Yep, still laughing. I know, I know, I'm easily amused. Jo, It's adorable and you stitched it fast! What a special wedding card that will make. Did you use a white balance setting on your camera to get the different color effects? I don't think I could limit myself to 30 stitches on a piece a day..too much fun to see the pattern develop, you are in control! Great finish for the newlyweds card!!! Have fun with your event. Oh how cute. What a great finish. Love your Just Nan progress. Beautiful! I don't know if we are friends on FB. I'll try to find you there. Oh I just LOVE how your Just Nan project is turning out. You truly are a woman in control...haha I might have just took off and started stitching after the first ten. What a great tip about the symmetrical design. I wish I could join you for the Longest Day (I had intended to when you mentioned it a while back) but I will be away from home, internet and probably my sanity at that point. I'll be thinking of you though!! I love your finish too...great choice for their card!! The wedding card is really pretty! Love the little beads! Just Nan's Spring is gorgeous! Lovely finish !! I like the idea of beads for the bubbles. Great progress on 10-a-day project. Your finish is perfect for an anniversary card,lovely stitching. What a great finish! It will make a fabulous card for a wedding. I love your Ten a day collage - it looks so cool, like time lapse photography and I do so admire your discipline. I like the idea of the wedding card and how your Just Nan project is progressing. You are most certainly a woman in control! 2nd time have started this comment, I think this is a great idea for a wedding card. And one I would keep forever. Gorgeous progress on your ten-a-day project. Last year I stitched with you on the longest day of the year. And I wanted to do it again as it was such lot of fun - but can't do it at the moment :( I can't follow you on FB but I'll be happy to see what you were stitching on when you blog about it. I cannot find you on Facebook. :( But I will be stitching on the longest day with you. DD is gone and I have the place to myself. Well, there is my hubby and the cat. That's a great finish, I do like Stichrovia's designs! And great progress on your dailies as well. Wheee I love your champagne stitch, such fun! 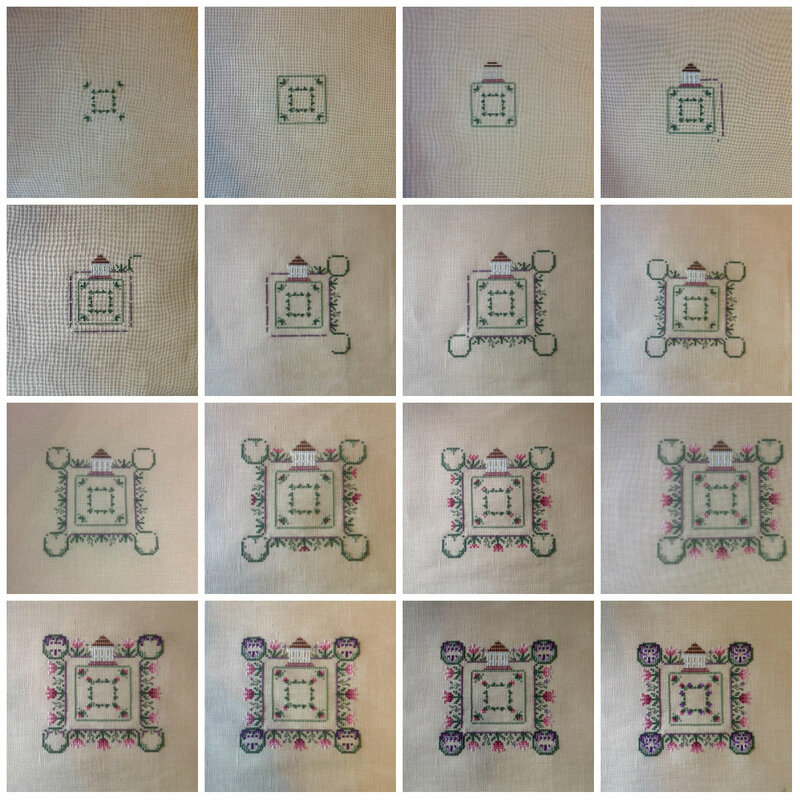 Very cool way of demonstrating the blossoming of your 10 a day wip. It looks so effective. Love the wedding card, and those beads look so pretty! I'd certainly keep the card forever! What a fast finish, well done! Spring in the square is gorgeous, and it is lovely to see the progress pictures!